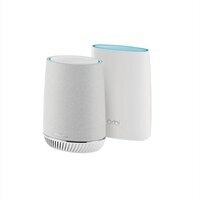 Orbi Mesh WiFi System with Orbi Voice delivers whole home WiFi with a superior smart speaker experience. Tri-band Mesh WiFi brings high-performance WiFi throughout your home and extends your existing WiFi for less buffering and dead zones. It has Amazon Alexa built right in so you can voice control your music and other smart home devices. Audio by Harman Kardon creates an exceptionally rich, room-filling sound. Enjoy the convenience of one WiFi name, Circle with Disney Smart Parental Controls, guest WiFi and other advanced router features. Orbi is ready right out of the box and works with your Internet service provider. Easily set up and manage your whole home WiFi and smart speaker with the Orbi app. Coverage for homes up to 4,500 sq. ft. with combined speeds up to 3Gbps. NETGEAR Armor – Built-in anti-virus and data theft protection for ALL of your smartphones and computers. Protects your connected home from internet threats.